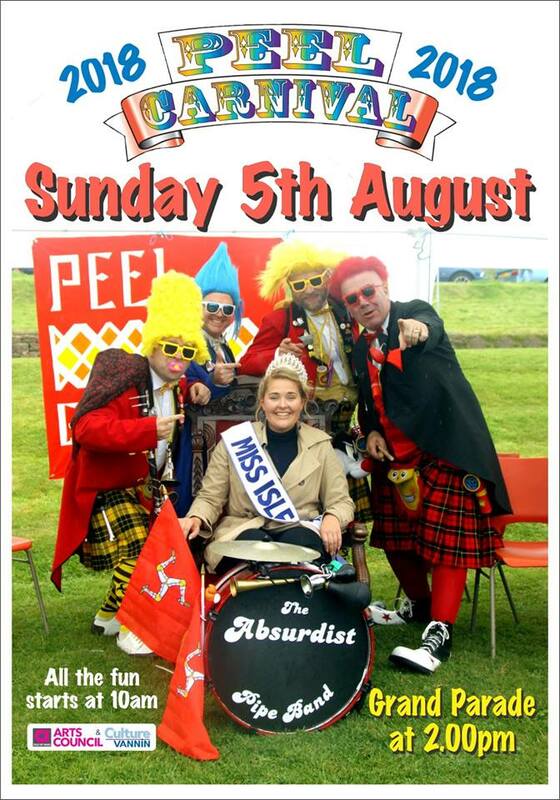 The poster for this year’s event features Miss Isle of Man, Peel’s Trene Kinrade with the Absurdist novelty Pipe Band who played in the Grand Parade last year. This year sees the return of the five ladies from Viva Brasil samba dance troupe who proved such a big hit when they first visited the island for the 2016 Peel Carnival. They will be performing again with the local Sambamann drum band together with old favorites like the Manchester-based Panfire steel drum band, the Jazz Aces and several other local rock and folk bands and dancers. For those taking part, there is over £1,000 of prize money to be won across eight classes such as floats, children’s and adult’s fancy dress, decorated bicycles and, this year for the first time, fancy dress for dogs. Participants are asked to assemble at the House of Manannan around 1pm on August 5th, register their entry with our officials there for judging shorty thereafter. The Grand Parade along the Quay and seafront to the Creg Malin Park will start at 2pm. The prize presentations and Post Parade Party will take place in the Park on arrival. Sponsors include Peel Commissioners, the Arts Council, Culture Vannin, Peel Charity Shop and Good Causes and the many local businesses who help make the event possible. The Carnival Organising Committee thank them all.